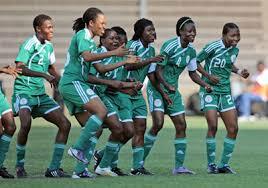 African champions Nigeria have flown to China for a 4-Nation Tournament as they kickstart their preparations for the 8th FIFA Women’s World Cup taking place in France this summer. A delegation comprising of 16 players and nine officials departed Nigeria aboard an Egypt Air flight from the Nnamdi Azikiwe International Airport, Abuja on Monday afternoon and was expected to arrive in the Chinese city of Meizhou, in the Guangdong province of the world’s most populous nation by Tuesday evening. Four other players, namely defender Faith Michael, midfielder Rita Chikwelu and forwards Ini-Abasi Umotong and Chinaza Uchendu will fly direct to China from Europe to join the team. Hosts China, Romania and Korea Republic are the other teams taking part in the four –day invitational starting on 17th January.